Every now and then, something happens that you never could have orchestrated on your own. And I love it when that happens, because I know it is God at work around me. A couple of months ago, I got an e-mail from Melanie. Melanie was eager to pick my brain about so much that we had in common. She was recently engaged to Misha. Misha, like my Michael, is also a quadriplegic. There are some things about their injuries and limitations that are similar, so Melanie and I had a lot to talk about, and we hit it off right away! Now, she's like a little sister to me! I treasure her friendship, and I like being on the "teaching" end of this, for once, because it at least makes me feel like I know what I'm doing! Haha. 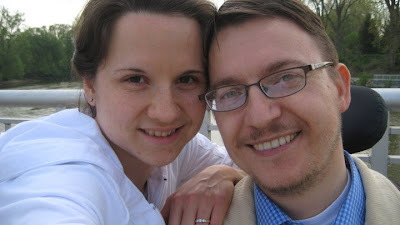 Michael and I have prayed, and prayed for this couple. We wish them the best of life together, as a team. Like any marriage, their marriage will face some challenges, plus some extra wild cards. Some times will be tough, some times will be hilarious, some unpredictible, but God is always with them. And so, are we. They are the inspiration behind Michael's Letters to a Paralyzed Husband series. Mel and Misha - CONGRATS, welcome to this wonderful married life!!! We hope to meet you one day! Wow! That is wonderful!! God is so amazing like that. Blessings to you Melanie and Misha. Marriage is a wonderful thing and I am so happy for you! Haha..so I just read this post, and we are almost 1 year married. You are so sweet Dana, and I know that Michail and I are both humbled by the fact that we inspired this series of posts...how special. I look forward to reading more here. Melanie, how funny that you just stumbled upon this! Can you believe it's been a year already? I need to get my Michael to write more of those posts! Haha.